Although the new batmobile has an interesting new look, it is a gas guzzler that probably gets 5 miles to the gallon. And what's with the flame coming out of the back? What a waste. That waste heat could be used. Would an internal combustion engine spit flames anyway? 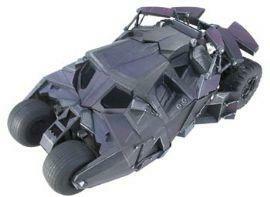 But then again, maybe Bruce Wayne would drive a Prius, but Batman is an SUV kind of guy. Do you favor Bruce Wayne in a Prius or Batman in an earthmover hummer?